Water fights are a popular activity here. 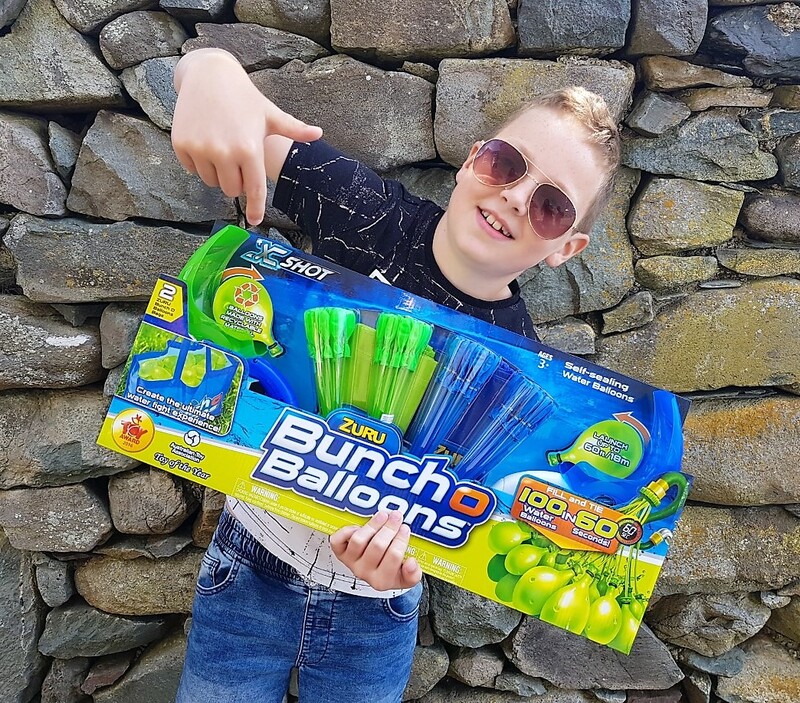 However rather sadly, we don’t have them as often as the boys would like as its usually such a hassle getting enough water balloons filled so the battle can last long enough! Normally tying water balloons is so fiddly and time consuming. Unless you have the patience of a saint its really not worth attempting. Fortunately, I was sent Zuru Bunch O Balloons and it really couldn’t be simpler. You just connect them to your hose and turn on the water. Soon you have a big bunch of water balloons all filled and tied to enjoy! 100 balloons in a minute, it really is something to see. Included in the pack is a size guide so you know how much water to add. The boys had no problems getting the water balloons ready themselves. I also really like the new products Zuru Bunch O Balloons are bringing out to enhance water fights! The boys were thrilled to see they had a launcher each and a bag to carry there water balloons. It just adds a whole other level of fun to the fight. Since my review I have noticed a Zuru Bunch O Balloons slingshot and catapult. I really struggle to think about what to get my boys for celebrations, they don’t play with toys much anymore. But these items would go down a treat. Most importantly don’t forget to pick up all the bits of plastic after the water fight. Think about the environment just like Zuru Bunch O Balloons do. They make their water balloons out of recyclable material. If you really want to unleash summer Zuru Bunch O Balloons are the product to do that! Just watch the video below to see for yourself. You will be impressed with how fast Mr Summer fills those water balloons! I have a competition to win a pack with one launcher and 3 bunches of balloons plus a minions 3 pack of balloons. The minions design is so cute. If you would like to enter please fill out the form below by the 16th of August and prepare yourself for a summer like no other. Don’t forget to enter my other competitions too.